At TESU, it doesn't matter where the transcript comes from, there will not be a letter grade. Only COSC works that way. I believe there's a lower-level Study.com course that works for the Principles of Finance requirement, but hopefully someone else can confirm. One of the Sophias will come in as a GenEd elective if you want it to (rather than just a free elective). The other is free elective only. Can't speak to the TEEX classes. So my only "grades" at TESU will be the Capstone and Cornerstone? Feels like that will make it much more difficult to get into another school like Baruch or something similar for an MBA? Would that make COSC a smarter place to enroll so that I receive a GPA? Also, as I am trying to work through this as quick as possible, how do the proctors work? I assume I need to schedule them for all the quizzes and finals in advance and they can't be taken whenever I would like? With 5-15 quizzes per course, feels like that will slow me down big time on Study.com & Straighterline? COSC still won't calculate those classes into your institutional GPA, even if they show a letter grade on a transcript. If a grad school cares about your GPA, they likely aren't going to be fooled by COSC showing a letter grade, since it will be clearly indicated that it's transfer credit. 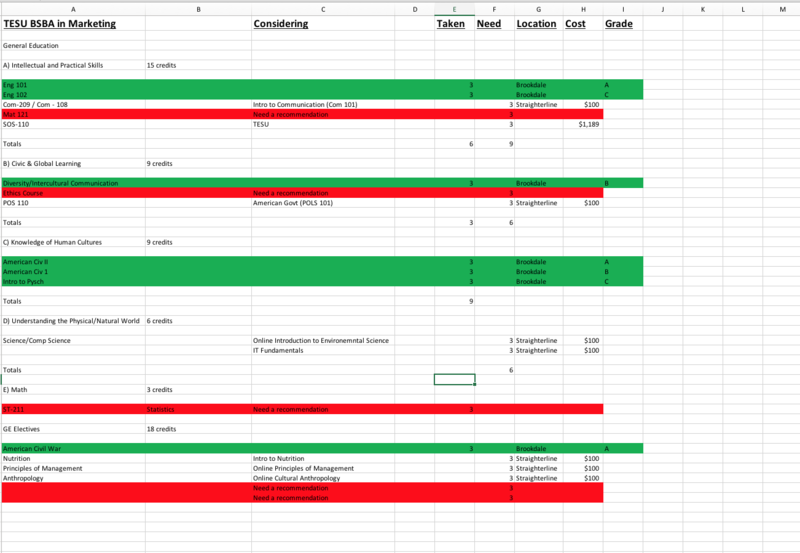 Look at requirements for places you'd want to do an MBA, and if necessary take actual classes for those pre-requisites. Study.com only has one proctored exam per course, and no advance scheduling is necessary. (04-16-2019, 12:06 PM)degreeguy Wrote: So I have enrolled in TESU, sent transcripts, took some free credits at Sophia, and put together a list of classes needed. 1. You only need 4 out fo the six courses for your marketing AOS to be UL. The rest can be LL. Save yourself some time. 2. If you knowledge in a subject the quickest and easiest way to credit is CLEP/DSST if you've worked in business long enough you could probably knock out the Clep management and marketing with to no studying and probably others too. It's a 90 minute test and you don't have to take the whole 90 minutes. 3. Make sure to set up an Ace account for the Sophia and TEEX credits. Do you have any recommendations for bullet point 1? (04-16-2019, 12:23 PM)degreeguy Wrote: So my only "grades" at TESU will be the Capstone and Cornerstone? Feels like that will make it much more difficult to get into another school like Baruch or something similar for an MBA? Would that make COSC a smarter place to enroll so that I receive a GPA? The grad school will look at all your transcripts and calculate their own GPA. In your case, that would be TESU and your CC. Which means those four F's will drag your GPA down unless you retake them at the same school. It won't do any good (from a GPA point of view) to retake them as alternative credit or even at TESU. That said, there are many, many MBA programs out there, and if your GPA meets the minimum requirements, your GMAT is good, and you have decent work experience, a low GPA may not be a problem. General advice to others: Never just quit without looking into the rules at your school. You can almost always avoid an "F" if you pay attention. Formally dropping a course will usually give you a "W" or a "WF" which either do nothing to your GPA or only become an "F" if you don't retake. If you have a medical or family crisis and it's too late for a "W", you can also usually request an incomplete, which gives you time to come back and finish the course later, usually without having to pay for tuition a second time or having to redo the work you've already completed. My daughter had to do that (request incompletes) with a semester at Berkeley. After she got better, she was able to finish her courses remotely (didn't have to move back to campus) without it costing us anything extra. For Finance, Study.com has two lower level Finance courses (101 and 104) that meet the requirement. Either one will work for the BSBA core. Microeconomics can be taken as a CLEP, or at Study.com or SL. Math needs to be College Algebra or higher. You can take that at Study.com (Math 105 Precalculus Algebra or 107 Quantitative Literacy) or Aleks. I believe there is a CLEP for it too. If you already know the subject well, Aleks will likely be the fastest (and cheapest). If you don't, use something free like Khan Academy to learn the material. Statistics is also available at Study.com or Aleks. For Ethics, I took the Institutes course before they lost ACE accreditation. I see that Study.com offers several Ethics courses but I can't confirm how they transfer. For Study.com, you will take a lesson (~5-10 minutes long) followed by a quiz. You can retake the quiz to get a higher score. Once you have completed all of the quizzes, you can jump right into the final exam. They can be taken at any time, since they just record your session/webcam and review it later. Another benefit is that many of the courses have overlapping material and as you complete quizzes in one course, it will likely complete quizzes in other courses. For something like Marketing, that will be helpful. Some courses offer a placement test at the beginning to see what you already know and that will help you finish them faster. Also, I don't think I saw it on your spreadsheet, but taking any course at Study.com will let you take advantage of their pricing discounts at TESU. (04-16-2019, 12:15 PM)mysonx3 Wrote: At TESU, it doesn't matter where the transcript comes from, there will not be a letter grade. Only COSC works that way. To confirm, using Straighterline as an example - a passing grade is 70% or higher, anything over 70% will be sent over as 3 credits and simply go on as pass? I just finished up my first class and scored a 92%, but even if it was a 70%, it would make no difference? Kinda stinks if that is what it is, but I guess there isn't much I can do about it. degreeguy, Happy Belated B-day (I read the last thread of yours, it was Friday the 12th - ain't we lucky it wasn't Friday the 13th...) Anyways, I reviewed the spreadsheet dfrecore created for you. You're just missing the AOS and a few courses that can be completed really quickly. Which providers have you signed up for and what courses have you completed so far? Have you signed up and paid for your Cornerstone at TESU yet? degreeguy Wrote: To confirm, using Straighterline as an example - a passing grade is 70% or higher, anything over 70% will be sent over as 3 credits and simply go on as pass? For all ACE/NCCRS credits, as long as you score 70% or higher, you get the recommended credit. I still tell people not to slack off just in case. It's better that you do well on your undergrad studies as it prepares you for the capstone course and grad school.